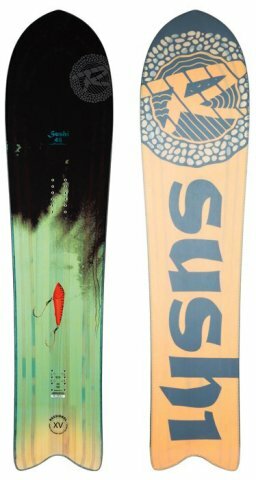 The Rossignol XV Sushi is a great board for the price and it’s a great choice for those that want to quiver up or just only Snowsurf at a reasonable price. It’s soo much more than just a powder board and it’s a very fun all conditions ride. Nothing that we know of changed from the 2018 model to the 2019 except we finally got to ride it in some good powder. Conditions: Dust on Crust, Good Groomers, and pretty light somewhat deep pow. Approximate Weight: Feels normal for its overall volume. Flex/Buttering: Easier to butter than you would think but the Rossignol Sushi is not really that kind of board. Sizing: The Rossignol Sushi is pretty wide in the waist and nose but it really tapers a lot towards the tail. That’s why I feel more comfortable recommending a board like this to riders in the 8-10 boot size range. It’s meant to be ridden wider in the nose/waist but a ton shorter. On Snow Feel: Some boards are short and fat but not that surfy. Some are normal length/width and surfy. However, the Rossignol XV Sushi is short, fat and super surfy. It’s a very off the back foot kind of ride that is very slashy off the tail but also very carvy. It’s stable underfoot though and not loose due to the camber from the tail to just a bit past the front bindings. It is very easy to one foot and flat base and although it has a tail heavy ride the back foot is further away from the tail than many boards of this type. Edge Hold: The Rossi Sushi is nothing like the XV when it comes to grip and the lack of magnetraction is noticed. It still holds a good edge but I would grab the XV if it’s hard snow. Turn Initiation: Despite its width, the Sushi is very quick edge to edge and I think it’s from the short size as well as all the taper going on with it. Turning Experience: Really fun board to turn and it shines on groomers as well as powder. We really had a fun time riding this when it wasn’t dumping and there is good spring out of the turn as long as you keep more weight on the back foot to keep that tail from washing out. Carving: The Rossignol XV Sushi can lay out a very hard carve and it isn’t the kind of board that needs to be left on the shelf when the powder is gone. I couldn’t be more happy with the way you could lay it out on a carve and I might have liked the feel of this board on a carve a little better than how it could handle a semi-hard driving line on a powder day off-piste. Speed: There was good speed on groomers and the XV Sushi can pick up some decent speed. It’s no XV though and I wouldn’t want to bomb a really steep run. In powder though, it’s not the kind of board that likes to pick up massive amounts of speed. It also didn’t keep it’s speed super well in powder so you had to keep your momentum while not going super fast. Uneven Terrain: The Rossignol XV Sushi is the kind of board that can weave in and out of moguls rather well but it’s not the kind of board that likes to powder over them. If you try to do that it will buck you around. It’s better than many short/fat rides we have tried but its still something that is going to be very different when it comes to riding 1-2 feet of powder with bumps underneath. It really likes a smooth surface to shine. Powder: We wouldn’t just call the Sushi a powder board but there are lots of directional floats here for its size. Check our comparison below review below. We felt the Sushi floated incredibly well but compared to boards like the Rome Powder Division and especially so with the Mind Expander it didn’t have that unsinkable float and you could feel the smaller size the deeper it got. It was almost as good as the mind expander for quick turns in the trees and it was a little better than the Powder Division carving on groomers. Back to powder though…..when setting back all the way on the board at a 22″ stance width you can get 15 inches back on board which is massive for a 145. Then if you add the rocker in the super wide nose you have a very good float. If you keep it to moderate speeds and get terrain that’s pretty smooth the Rossignol XV Sushi is a fun way to surf powder. The rest isn’t that important. It doesn’t ride switch well at all, it’s fun to slash a pipe wall with, kind of tail light for lots of air and not a good board to jib with. Here is a detailed comparison between the Jones Mind Expander, Rome Powder Division 157 and Rossignol Sushi. We try to get as many images of the Rossignol XV Sushi, but forgive us if they're not all there. Back on the mountain after 5 years off (2 back surgeries). GNU Riders Choice to have a single board quiver. Came across the Sushi. Growing up in San Diego and having surf roots, DAMN this board is FUN!! I thought this would be my POW board and tree board. Not only does it rip in POW and trees, Groomers are so fun. I feel like I am hitting the lip of a wave all day. Super Sic!! I have been waiting for a board like this for about 10 years now after riding a similar unknown brand. Its actually quite floaty and has good speed through the trees, which is where it really shines given the back foot near the rear of the board and the big powder nose. Perfect for powder in the morning and groomers in the afternoon I find.